The Project Management Association of Canada administers the Canadian Project Management Book Awards. These annual awards are given out to Canadian books published in either English or French that primarily deal with one of the 46 competence elements in the Canadian Project Management National Competence Baseline. 2010 was the first year we presented these awards. The winners are listed below. Please read the 2011 Canadian PM Book Awards page to read the latest information on award categories, eligibility, how to apply, the judging process, and prizes for the 2011 book awards cycle. For more information, please contact Alex Jalalian, our Director of Awards [awards@pmac-agpc.ca]. 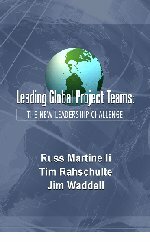 "Leading Global Project Teams: The New Leadership Challenge"
An excellent introduction to the subject. The text is easy to follow and is enhanced throughout with real world examples. The book is well laid out with an intuitive flow that adds to the comprehension of the material. A comprehensive set of references guides the reader to additional and in-depth study materials, and validates the assertions of the authors. A highly enjoyable and informative book that ties in closely with the ICB v3 requirements for senior project and program managers. "Agile Leadership and the Management of Change: Winston Churchill and the Battle of Britain"
Based on my limited knowledge of Churchill's leadership during the war, I found this book to be informative and really enjoyed the parallels to modern-day agile leadership, change management and project management. The closing of each chapter contained a conclusion, key lessons, as well as a brief note to educators to bring about discussions on key learning to help solidify the points the author was making. In addition, I particularly found the Conclusion, Wrap Up and Takeaway sections a good way to reinforce the topics discussed in this book. "Agile Leadership and the Management of Change" provides the reader with a unique experience by exploring Winston Churchill's efforts in the Battle of Britain while at the same time putting these events in context with respect to agile leadership as well as project management competences. For years, it has been reinforced that mankind does not heed the lessons from history and is bound to constantly repeat the same mistakes. Mark Kozak-Holland, through his extensive research and his approach, enhances the reader's ability to read more than just the historical facts. From time to time, as project managers with all of the difficulties that confront us, we come to understand that we are leading the "project from hell." Clearly, after reading this book, we see that our projects are nothing compared with what Churchill faced -- the survival of the last bastion of freedom from fascism. Without Churchill's agile leadership directing both short and long-term objectives, Britain would not have been able to withstand the onslaught of overwhelming enemy forces. But it was not just Churchill's application of agile leadership that saved the day. Churchill had wisely chosen other key individuals who also applied the principles of agile leadership to achieve their objectives. Without his skills in agile leadership, Churchill would not have been able to change the evacuation of Dunkirk from a major defeat to a major victory. In essence, as you read this book, you will realize that Churchill had perfected agile leadership, enabling him and his team to lead Britain out of the dark days before and during the Battle of Britain. The structure of this book enhances the transfer of knowledge to the individual reader from beginning each chapter with a summary of what is being discussed to summarizing key lessons learned at the end. The reader can directly relate to key lessons while they are fresh in his/her mind. For those who enjoy reading history, this book provides unique insight. "Thinking on Purpose for Project Managers: Outsmarting Evolution"
Thinking On Purpose will challenge you to rethink how you think. It highlights how the evolution of the human brain both helps and hurts us as we travel through the modern workplace. It provides an easily accessible set of tools that will help you to become more effective in solving the tough issues that every project manager faces. The contents are well organized and clearly laid out to make it easy to determine which tool to use for any problem that you need to work on. I thought the ideas of making the effort to think things through and structure my thinking provide an interesting perspective. I especially liked the 5-step process for thinking on purpose. With the new perspective of framing my thinking, I experienced immediate benefits that allowed me to resolve a project issue. I enjoyed the case studies that helped to reinforce the content of the book. The book should be considered as a reference on structured thinking and will need to be referred to many times. The author had a lot of good advice for everybody -- not only project managers. Using the "Thinking on Purpose" approach would prevent or mitigate many common project management problems. Well organized with the ending of one chapter leading into the next. Very informative on the subject matter, supported by references and tables; however, the academic style of the writing makes it a difficult read and the author's perspective is not always clear.